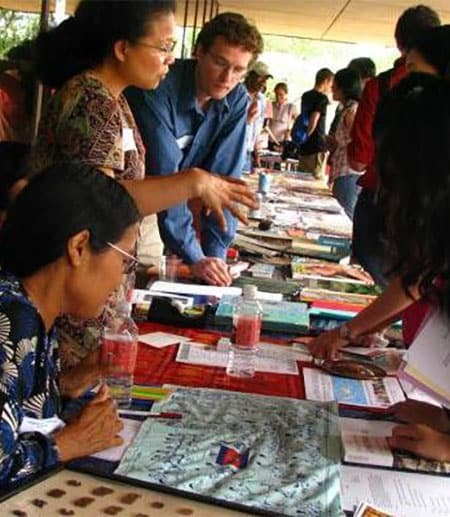 Instructors of the six major national languages of Southeast Asia – Burmese, Indonesian, Khmer, Filipino (Tagalog), Thai and Vietnamese – from across the U.S. will gather at Cornell Sept. 8-10 for the Southeast Asian Language Teaching: New Directions Conference. Organizers expect the conference to be the largest ever to address pedagogical developments and innovations in the teaching of these languages. The conference is being hosted by the Southeast Asia Program, in collaboration with the Department of Asian Studies and the Language Resource Center in the College of Arts and Sciences. The conference will include poster presentations and demonstrations on innovations in Southeast Asian teaching, pedagogy workshops and sessions on heritage languages. The conference will use a technological innovation that has made less commonly taught languages more accessible: A session on nontraditional teaching methods given by Amrih Widodo, Australian National University, will be delivered via teleconference from Jakarta, Indonesia. The first keynote address, “Culturally Speaking: Intercultural Competence and Attaining Advanced L2 Proficiency,” will be given by Thomas Jesús Garza, University of Texas Regents and University Distinguished Teaching Associate Professor in the Department of Slavic and Eurasian Studies, director of the Texas Language Center, and interim director of the Arabic Flagship Program. The second keynote address, “Challenges and Potential in the Field of Southeast Asian Language Teaching: Reflections from SEASSI,” will be given by Ellen Rafferty, professor emerita in the Department of Asian Languages and Cultures at the University of Wisconsin-Madison and language director of the Southeast Asian Summer Studies Institute. Cornell is a Title VI National Resource Center in Southeast Asia and works collaboratively with other Title VI centers to support and promote instruction in these languages to train future scholars and diplomats. The conference is organized in collaboration with the University of California at Berkeley and Los Angeles, and the University of Wisconsin, and is funded through Title VI NRC funds and support from the Henry Luce Foundation. Representatives from all seven Southeast Asia NRCs will participate in the conference along with colleagues from a number of institutions offering instruction in one or more languages of Southeast Asia. “Cornell’s Southeast Asia Program is pleased to be able to facilitate this collective effort to support and strategically develop the future of Southeast Asian language instruction,” says Cohn.